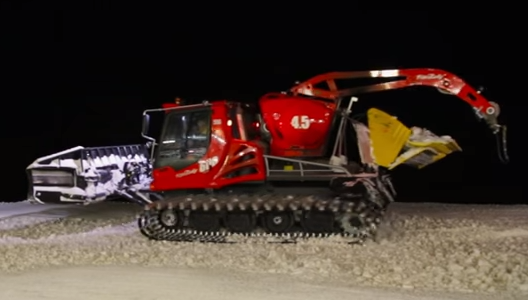 Snow groomers – popularly known as ‘Piste-bashers’ – are rarely seen on the slopes during day. Unless you stay on the mountain until after the lifts have closed, or you get up really early, you might not see one at all. That’s because most of the work grooming the pistes take place while you are tucked up in bed. In Val Thorens, the snow groomers work in two shifts, with the first starting from 5pm through to 1am and the second night shift working from 3am to 9.30am. As in most resorts, the evening shift tends to focus on the pistes that have been most degraded, either by the sun or by sheer volume of skiers. These are typically south-facing slopes that see more sun. This leaves them the most amount of time to harden up following treatment before the next day’s skiing. Finally, a giant yellow ‘comb’ at the back is used to leave a perfect finish to the snow by smoothing it and adding the grooved, corduroy texture we know so well. Steeper slopes require a specific machine that has a winch. This is secured at the top of the slope and the groomer then can reverse down safely and allow it to push snow back to the top of the piste more easily. Although ‘easier to drive than a car’ to become a proficient driver takes at least three years. The real skill is ensuring the slope is well-finished and driving the groomer as efficiently as possible. The time is required to build up experience of different weather conditions: one year you might get a lot of snow, another year it might be in short supply. Other challenges are presented by high winds which can make driving a groomer extremely difficult. 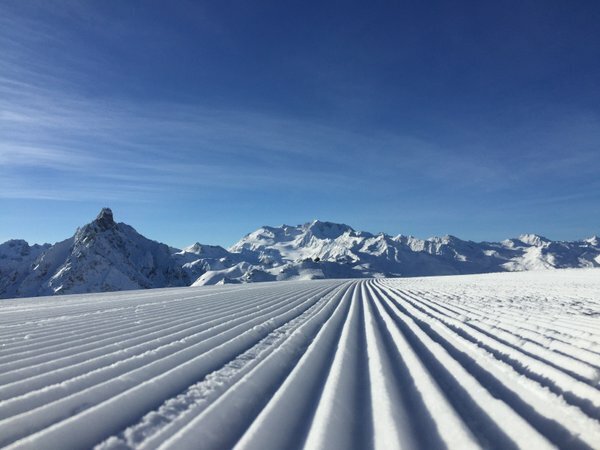 For details of how to get out to the French Alps to ski some of these beautifully groomed pistes, please contact the Chaletline team on 01822 617761. This entry was posted in Val Thorens and tagged piste bashers, snow groomers, val thorens. Bookmark the permalink.